The anti-police brutality protest, notorious for its violent turnout, was mostly peaceful and recorded no arrests Saturday night. Following months of continuous student protests, roughly 200 protesters gathered at Place Émilie-Gamelin before marching through the streets of the downtown core to condemn Montreal Police’s use of excessive force. Demonstrators were notably present to denounce a recent mass dismissal of complaints against police behaviour filed during the student conflict. The Montreal Police’s ethics commissioner could not be reached for comment due to the holiday weekend. According to the Huffington Post Quebec, the reason behind the dismissals are either a lack of information in order to proceed with an investigation, or the alleged victim dropping the case. The Montreal Police’s Ethics Commissioner Louise Letarte also said that the number of dismissed complaints might increase as the department reviewed only 149 out of the total 193 complaints received related to the student conflict. So far, 60 complaints will lead to further investigation for which the result will appear in spring 2013. Angered by the dismissals and feeling powerless against a police force individuals believe used excessive violence in interventions, some protesters expressed their concerns over the SPVM’s ability to exercise control over its own officers and to sanction them in the adequate manner. Saturday’s protest was declared illegal by the police before it began due to the organizers failing to provide a march route. The demonstration was still authorized providing it remained peaceful. 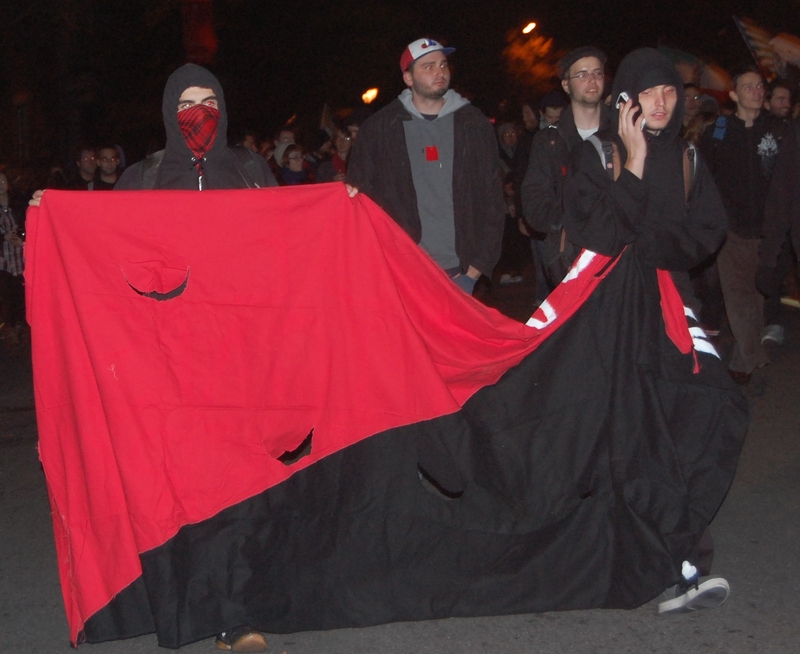 The protesters, many of them masked and dressed in black, left Place Émilie-Gamelin at 8:45 p.m. closely flanked by officers and followed by mounted police. They walked through the streets of downtown Montreal, improvising their route and often walking against traffic. Aside from a few busted traffic cones and firecrackers, the protesters carried the march until it ended at its starting point around 11 p.m. with a single individual receiving a ticket.